ZenoRadio (http://www.zenoradio.com), the largest source of radio broadcasts for US diaspora communities, announces the launch of ZenoLive on Thursday, February 18, 2016. ZenoLive is a free disruptive broadcasting platform that enables anyone to create and distribute audio content in seconds. From listeners who want to be heard, to independent hosts and traditional broadcasters, ZenoLive’s platform offers a complete studio on a phone, laptop or broadcast console. Broadcasters go live in seconds with no downloads or equipment needed. ZenoLive affords interactivity where listeners and hosts can raise their hand to be brought into a conversation, take a poll or countless other interactive features. All the interactivity happens with a unique “speak to the host” button and feature on dial-in, app and web listening. ZenoLive aggregates data of all the broadcasters’ listeners in real time with enhanced and efficient monetization opportunities through paywalls and smart ad targeting. “ZenoLive is an incredible way for listeners to become creators and have their voice heard and discovered. From around the corner or around the world, making anyone a radio or podcast star without the hassles of studios, equipment and cost is something that makes us proud. This is really a game changer. For veteran podcasters, or even for those who’ve never picked up a microphone looking to go live, we can introduce you to our millions of listeners.” said Morris Berger, Chief Executive Officer. 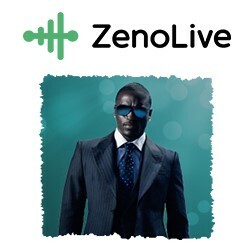 ZenoLive is a free, disruptive, patent-pending broadcasting platform available worldwide. ZenoLive enables anyone to become a streaming audio broadcaster. The content creation platform and live dynamic audience engagement enables interactivity and offers reporting modules to hosts and broadcasters. ZenoLive affords for all its content to be heard by dialing a phone number, mobile app or via a web browser. No additional equipment is needed. ZenoLive offers advertisers the opportunity to reach a targeted and viral US immigrant community through audio prompts on its platform. ZenoRadio is an innovative service that enables users to listen to live and archived news, sports, talk, and music from “back home” on any mobile or landline phone. No data plans or smart phones are needed. ZenoRadio’s proprietary platform affords Broadcasters an opportunity to increase their market share and footprint among listeners across the US, Canada, Caribbean, Asia, Middle East, Central and South America, EU and Africa. ZenoRadio offers advertisers the opportunity to reach a targeted and viral US immigrant community through audio prompts on its platform. About Akon - Akon is an American-Senegalese RnB singer and producer. Brought up in a family of musicians, he spent his early childhood in Senegal before leaving at the age of seven to live in the USA in Union City, New Jersey. A Grammy-nominated, multi-platinum selling artist, producer, entrepreneur, and philanthropist, Akon is one of the world most influential voices in music today. In addition to having two multi-platinum albums, 27 songs on the Billboard Hot 100 and over 150 guest appearances with artists such as Michael Jackson, Whitney Houston, Eminem and Gwen Stefani, Akon is the first artist to accomplish the feat of holding both the number one and two spots simultaneously on the Billboard Hot 100 charts twice. For more information on ZenoRadio and ZenoLive, please visit http://www.zenoradio.com or http://www.zenolive.com.